If I had to decide if I were a brownie girl or a blondie girl, I’d have to vote brownie. I never really got into blondies. They remind me of chocolate chip cookie bars. And I do really like chocolate chip cookies, so why bother with a blondie. I treat myself sometimes to the NY Times on Wednesdays. If I happen to be grocery shopping that day, I’ll pick up a copy. I love to read their food section and sometimes come across a great recipe I must try. Of course, I’ll save that section of the paper and it gets added to my pile of “must-make very soon” recipes from magazines and various things I print out. It will inevitably get lost or thrown out and most likely, never made. When I saw this recipe a couple weeks ago I made sure that it would never get lost and made it immediately. Because I always have ripe bananas just begging to baked into something. That something is usually banana bread or banana muffins. Occasionally they will be a lovely addition to our pancakes. On this fine day that I had to make a recipe from the NY Times immediately, they were added into blondies. I know…I know…two chocolate recipes from me in a short matter of time. What is going on? I really wasn’t sure what to use for the crust. I found some chocolate bear cookies that the kids asked for and of course, never finished. They worked splendidly for this crust. Browned butter. Oh yeah. It’s incredible. Chocolate crust with a filling packed with bananas. Melt 1 stick of butter in a saucepan over low heat. Add the chocolate wafer cookies to the bowl of a food processor and process to make fine crumbs. Add the light brown sugar, melted butter and a pinch of salt. Process until the mixture is the consistency of damp sand. Dump the mixture into the pan and press it into an even layer. Bake for 7 to 10 minutes, or until the surface is firm. Remove the pan from oven and set aside. Brown the butter in a heavy-bottom medium saucepan over medium-low heat. When the butter has browned (about 3 minutes), set aside to cool. In a large bowl, whisk together bananas, eggs, dark brown sugar and rum. In a separate bowl, whisk together flour and fine salt. Pour the mixture over the prepared crust and spread evenly. Transfer pan to oven and bake until the top is firm and a toothpick inserted in the center emerges with a few crumbs attached; 45 to 55 minutes. Cool completely on a wire rack; cut into 24 bars. 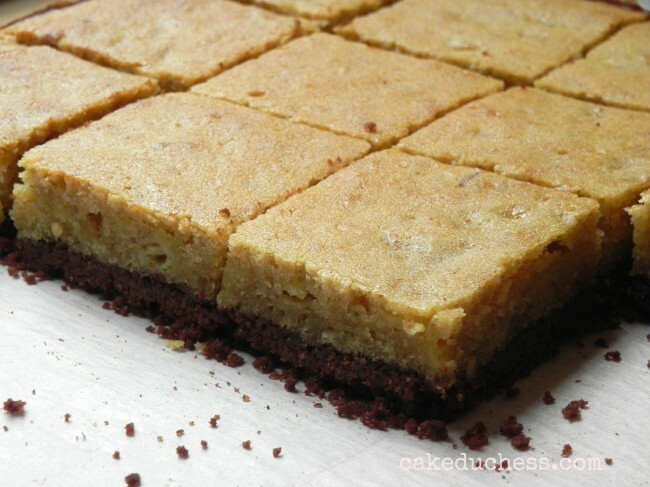 I too think blondies are cookies in bar form, and someone accidentally baked them in a pan. And I usually have brown bananas, like right now. I really don´t know why I bought them. 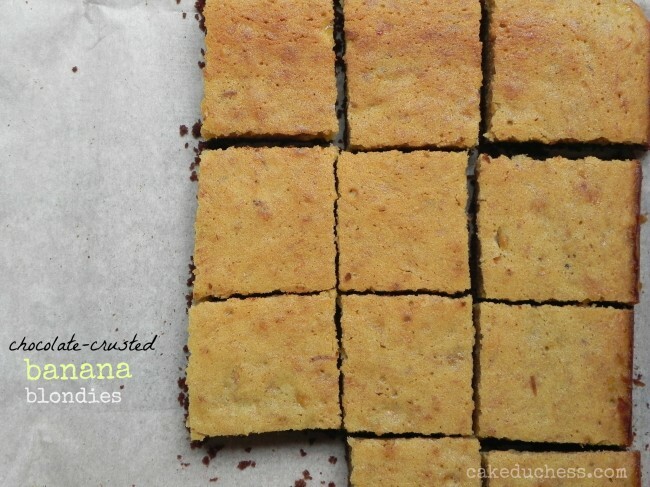 I think this is probably one of the best banana recipes I´ve seen lately Lora! With chocolate, bananas are so good, so good. What a super yummy combination of flavors! These look so good, Lora! Love the chocolate crust! What fabulous blondies, Lora! I love the banana with the chocolate! Enjoy your Sunday!!! Oh my worrrrrrrd!! This is what Love looks like in a Blondie! WOWOWOWOW! Love the rum with the banana!! I'm not much of a blondie girls either, but these guys look pretty darn tempting. Well done! These look wonderful!!!! I am an avid baker and cookies are my specialty. I agree with your opinion on blondies but I'm a bit intrigued by the crust. My problem is I'm allergic to bananas so can you suggest a substitution please? Love your blog!!! Agree. I prefer brownies and when I make blondies there are always chocolate chips in them. But sometimes I do crave them. And this recipe sounds just the right change from my usual chocolate chip banana bread (and I'd cut back the sugar, too). Yours look scruptious! Wow, this recipe looks incredible. I think you did well in cutting back the sugar… there's still heaps in there, and anything banana-ey and overly sweet tends to be a bit sickening! I also have ripe bananas in the fridge. I reckon I might use them to try this recipe! Oh, and I tried making blondies for the first time this week. I'm not sure what I expected, but… yes, I agree that it tasted like a big, pan-baked cookie. A little disappointing. Maybe this recipe will give me a renewed interest in blondies! Thanks! Oh my, oh my. This sounds like the best of both worlds. Banana bread and chocolate and fudgy brownie/blondie goodness. I can see why you wanted to try this recipe. Now I'm hankering to do the same! Thank you for sharing sweet Lora! Yummy! I love banana and chocolate combo! 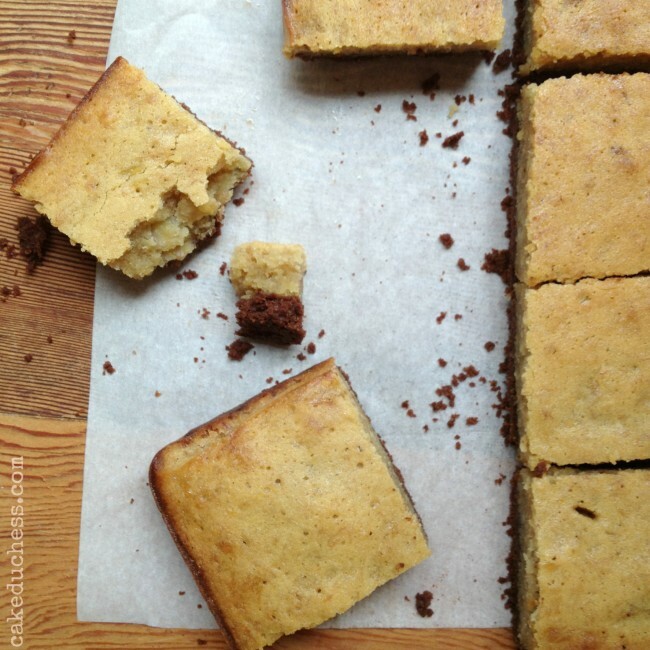 And love it how you made a chocolate crust for these scrumptious blondies! Wait. 1 cup flour. 2 1/2 cups sugar?! That's insane. You definitely did the right thing by cutting back on the sugar. That has to be a typo! And nobody's going to complain about a few chocolate desserts. I'm pretty sure we're all quite happy about it. 🙂 Oh, and these look super yummy! Chocolate crust with banana in the filling! Can imagine how happy your kids were when they got to taste these! !